Minimum size per lot - 10 000 units of base currency. Minimum initial deposit for mini forex account - $100. Margin requirements for mini forex trading - $50 per lot. Market Swaps (for carrying over your opened position to next trading day). Swaps are indicated in the points (pips) per one lot in the table below. Sufficient disk space (we recommend you at least 5 MB of free disk space to download and install the TradingDesk Pro 5 software). A pen and paper to note your user ID and password you will use for access to your mini forex account in TradingDesk Pro 5 after registration. 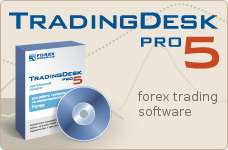 Download and install the TradingDesk Pro 5 software. Click the "Registration" button and select Demo or Real account in the next window. If you are registering demo account than enter your name, country, email, login and password. If you are registering real account enter the required registration information: enter your bank details for wire transfers. When you've entered all the required information, click Next. The Register Summary screen shows all the information involved in the registration you are going to make. If any information is incorrect, select Back button to move to the appropriate screen and make changes. If all the information is correct, click "Finish" button. Once you've finished the registration process, the software launches automatically! Your account number and registration information are automatically entered into the TradingDesk Pro 5 and registered at the central Dealing Desk system data base. You can now enjoy your registered real mini forex trading account! At this time, you'll have an access to your personal trading account information, but from the beginning you can see that your current balance is zero and you're unable to make any deals with it. Go straight to the "Real Account" menu, then to "Deposit" where you have to insert the amount of your initial marginal funds and push the "Send order" button. If you registered demo account than this virtual amount of money will be deposited on your demo account automatically. If you registered real account than note thant this is preliminary order only and it is required each time before you will make real wire transfer to our Bank account. As soon as your marginal funds come to our bank account you can start your real mini forex trading. Usually it takes 2-3 days. Withdrawal procedure is even easier. You go straight to the 'Real Account' menu, then to "withdraw" fill the amount you wish to withdraw to your bank account and push 'send order' button. And we will wire your money back to you Bank account.